I first spotted this strange piece of graffiti when walking past Gemini Café. The word ‘gauranga’ is scrawled in a cursive font, in what appears to be pink chalk. What I did not realise, however, was the frequency with which I would start to notice this piece of graffiti. In Fallowfield, on Oxford Road, by Manchester Metropolitan, and most recently in Piccadilly Gardens, my eyes are drawn to the soft, pastel pink mural. Could ‘gauranga’ be a gang? This thought came to mind while I was dozing off in a 4pm lecture… But what kind of organised crime group would use this floral hue of pink to mark their territory? There is a certain gentleness that exudes from this word, the soft consonants and open vowels certainly seem to lend it a sense of optimism. The mystery surrounding this unassuming piece of street art was starting to vex me – perhaps this is more a reflection of my boredom than anything else. So, like any diligent detective, I took to google to find the answer. Needless to say, the results weren’t all too fulfilling. They did, however, provide an interesting and unexpected insight into the Hare Krishna religion. According to the internet, Gaurāṅga is the name of the incarnation of Krishna in Gaudiya literature. In fact, there are also theories that the word translates to “peace my brother” or “be happy”. Hare Krishna is another way of referring to the International Society of Krisha Consciousness; a religious movement based in Hinduism, which was established in America in 1965. The group worships the Hindu god, Krishna, as the only God. You may have seen the group parading down the streets in many cities, dressed in sweeping orange garments, playing music, and handing out Hare Krishna literature. Manchester’s ‘gauranga’ however, does not seem to be an isolated phenomenon. An old BBC article from 2011 recounts how the word ‘gouranga’ suddenly appeared on 150 motorway bridges in the 1980s. Despite being spelled slightly differently from the word we are accustomed to, ‘gouranga’ is rumoured to have the same Hare Krishna origin, and became mini landmarks on the motorways of the North West. The omnipresence of the graffiti even led the indie band ‘Half Man Half Biscuit’ to embed the line “Gouranga Gouranga, yes I’ll be happy when you’ve been arrested for defacing the bridge” in their song, Twydale’s Lament. Despite not knowing the identity of the group behind this more recent campaign, the thought of a benevolent graffiti gang trapesing across Manchester wishing us all happiness is a pleasing idea. In the grey of the Manuncian winter months, ‘gauranga’ represents a small reminder to stay positive. 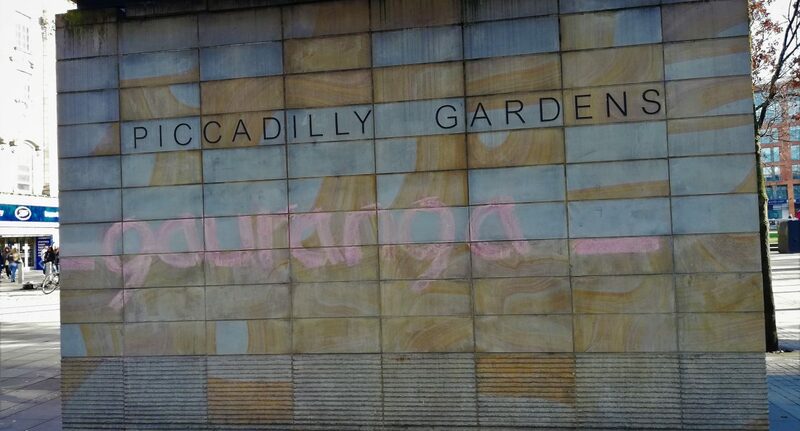 Editor’s note: We are aware of allegations of a ‘scam’ charity operating in the area, allegedly under the name Gauranga, however we are not aware of any evidence that the graffiti around Manchester is associated with this supposed organisation.